We propose a numerical algorithm for backward stochastic differential equations based on time discretization and trigonometric wavelets. This method combines the effectiveness of Fourier-based methods and the simplicity of a wavelet-based formula, resulting in an algorithm that is both accurate and easy to implement. Furthermore, we mitigate the problem of errors near the computation boundaries by means of an antireflective boundary technique, giving an improved approximation. We test our algorithm with different numerical experiments. Chau, K.W, & Oosterlee, C.W. (2016). 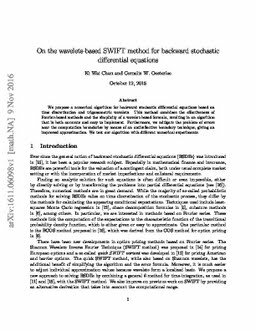 On the wavelet-based SWIFT method for backward stochastic differential equations.